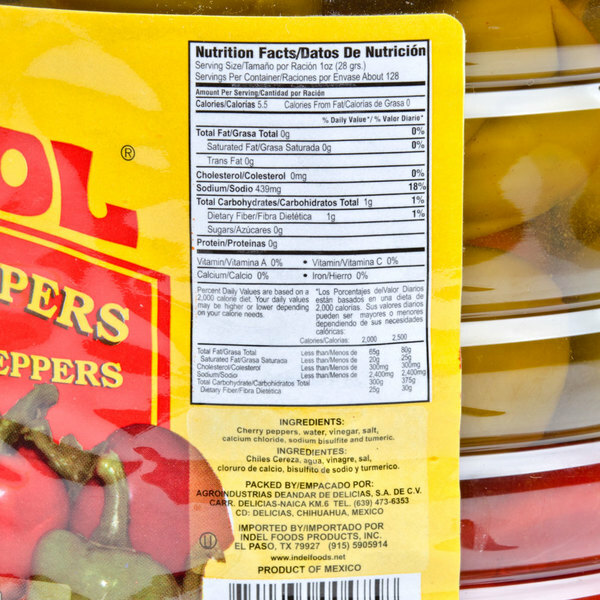 Delivering bold flavor with the perfect amount of heat and spice to please your patrons, enhance your menu with these Del Sol whole cherry peppers! With fresh, distinctive taste and crisp texture, these cherry peppers are sure to add a pop of bright color to any plate. Also known as pimento peppers, these aptly named cherry peppers share the similar small rounded shape of cherries. Whether you're serving a dish with contemporary flair or a traditional Mexican favorite, these cherry peppers are sweeter and milder than other chili pepper varieties, so all of your patrons are sure to enjoy! As opposed to sliced or diced peppers, try stuffing these whole peppers with bread crumbs, feta cheese, or any signature mixture of your favorite ingredients. Serve with crackers and cocktail olives for unique hors d'oeuvres during your cocktail hour or special event. Delivering an authentic spice, these cherry peppers intensify the flavor of your chicken, eggs, steak, and sausage alike! Spice up your hearty stir-frys by adding plump whole cherry peppers. Add to your salad bar with beans and cheese, and create a Mexican-style salad! 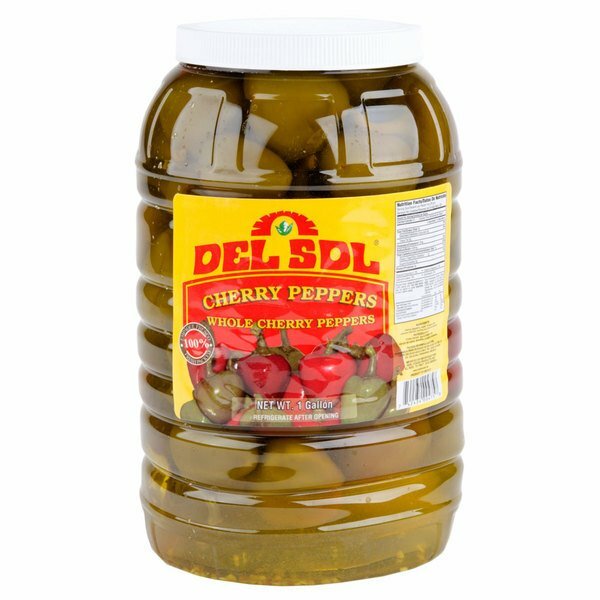 Carefully grown in the valleys of northern Mexico, Del Sol's cherry peppers are picked at their peak of ripeness for maximum quality. Because they are packed into containers the same day that they are harvested, you receive only the freshest peppers to complement your dishes. These peppers ate anything but "cherry". Holy cow are they HOT!! Don't get me wrong, I like hot. Cherry peppers are supposed to be mild (the word cherry). On the bright side, the price was fantastic. Just need to change the sign on my salad bar to "hot cherry peppers"
The Del Sol gallon whole cherry peppers are really wonderful and have a great quality texture. They are very bold and make are great for adding to our salad bar. A very good whole cherry pepper that are perfect for stuffing with cheese. They are also so good in my pasta dishes as well for extra flair. These whole cherry peppers are good when sliced and added to many dishes. These are good with eggs, steak, chicken, tofu, cheeses, many different foods. We love, love, love cherry peppers. Have only been able to purchase these at local grocery mart in 16oz size. The one gallon size doesn't last long in our home. I use these in salads as well as puréed and used in fresh tomato sauce. Keep in mind these are not sweet they are spicy and have quite a bite to them for the person who loves spicy food. Excellent on a chautetuerrie board paired sharp cheeses and cured meats. These are good peppers. We find the prices much better than buying them from the other vendors we were using. Even with shipping, we are saving money. this so0 great i use this Del Sol 1 Gallon Whole Cherry Peppers for garnishing my food buffet my sandwiches gret and this good flavor too hot!!!!! Who doesn't love a bite of a nice cherry pepper with a burger or hot dog? Or how about some sliced up and thrown on your Sausage and Peppers Hero? Yumm!!! These are delicious. Awesome deal too. 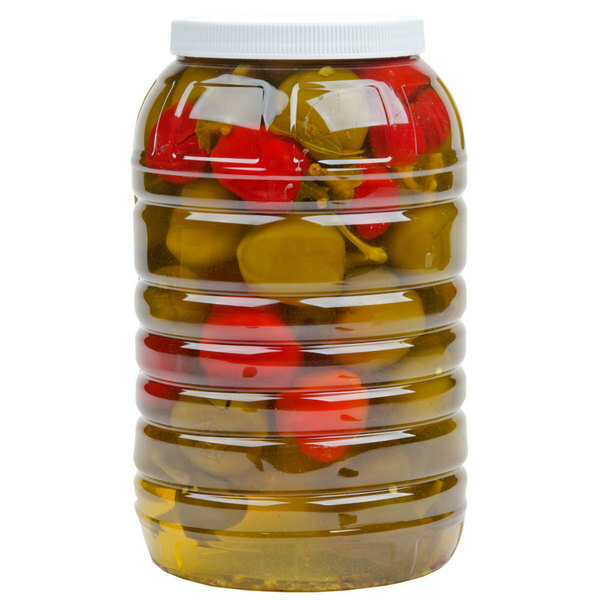 Saw a container of these in the big box store the other day... the container was 2 liters... and more than what I got a whole gallon for here on Webstaurant! Good product and a good price. Incredible price! We ordered these for sandwiches, place them in small bowls at the table to spice up Steaks, Chicken, Pork or Hamburgers and hot dogs. Just the right size Jar for our use, will be re-ordering again.